On the day after Christmas in 1776, General George Washington resolutely led American revolutionary troops across the Delaware River, the first move in a surprising attack against the English and Hessian troops in the Battle of Trenton. Confidently, the General inspired his soldiers as they struggled against great odds to cross the icy river at dawn. 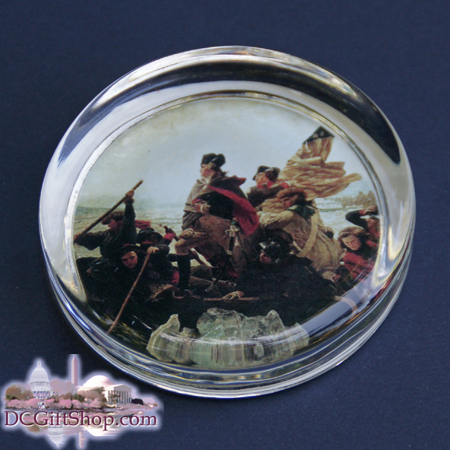 Painted by artist Emanuel Leutze in 1851, Washington Crossing the Delaware interprets this historic moment. The original overwhelming masterpiece is more than 12 feet high and 21 feet long. General George Washington, destined to become the first President of the United States, stands erect and heroic, focusing his thoughts on his objectives. Colonel James Monroe (the future fifth President of the United States) struggles at Washington's side to keep the flag aloft, a promise of democracy and freedom for the American colonies.